Throughout the year, RBKC libraries welcome a number of volunteers and work experience students from neighbouring secondary schools. For many, it can be their first introduction to the world of work and for us, it’s a great opportunity to reintroduce them to the library service and the vast range of services we now offer. Over 500 educational courses – free! Alongside Learning Nexus, the Royal Borough of Kensington and Chelsea has recently invested in a fantastic new online resource for library users interested in the pursuit of lifelong learning! Universal Class is a real treasure trove of online learning, with over 500 free courses to choose from, in almost any subject area you can think of. All you need to do is join the library (if you are not already a member) and sign-up online. Subjects range from ‘Office Skills’ and ‘Psychology’ to ‘Performing Arts’ and ‘Finance.’ Each course comes with dedicated instructors, module based lessons, assignments and tests. You can sign-up and look for the course you are interested in anywhere, anytime: among the many benefits of Universal Class is the ability to learn at your own pace, and in your own time. This flexible approach is especially useful for those of us juggling multiple priorities in our day to day lives! Of particular interest to existing customers of Kensington Central’s Business Information Point will be the online business courses, which are available to anyone wanting to study business, start a small business or need help with their existing business. If you want to find out more before getting started we will be holding introductory ‘Online Learning’ sessions during Adult Learners’ Week in June. 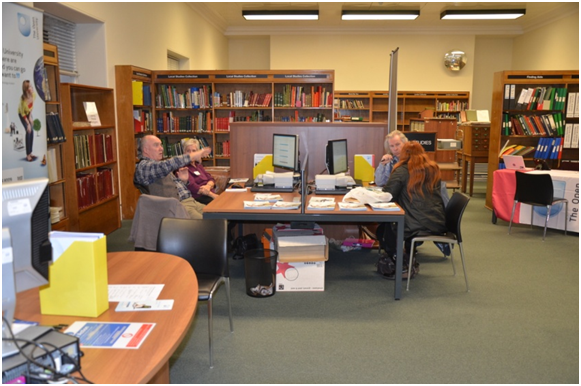 Whether you are looking for practical advice on setting up a business, seeking new contacts to help develop your company, creating a mailing list or swotting up on the latest information for your next job interview, Business Information Point at Kensington Reference Library can help. Our online database subscriptions include MINT UK and Keynote Market Research. Both these databases are available from inside the library. There is also COBRA, the complete business reference adviser, which is available in the library or remotely, from your home PC using your library card number. A selection of Keynote reports is available in hard copy as well. Please follow this link for a full list of online databases. Events and Workshops: The library is also hosting free workshops and networking events specifically for people looking to set up or grow their own business. These events offer a fantastic opportunity to learn from those in the industry who successfully run businesses and understand current risks, challenges and possibilities. Please follow this link for a list of list of our Jobs & Careers events 2015. Hello to you all from the staff at Kensington Central Library. We’d like to wish you all a Merry Christmas and a Happy New Year. If you’re planning on visiting us over the holidays please check our Christmas and New Year opening hours first. We’ve had another busy month so read on to find out what’s been happening. Sandeep Dhaliwal, one of our Tri-Borough Reference Librarians blogged about The Open University coming to Kensington Central Library last week to deliver one of their Information Events. Over to Sandeep to tell us more….. I am pleased to say that we had 43 visitors to this event with over two-thirds attendees from West London. The diverse age range of the attendees highlighted that learning is a life-long exercise – people aged in their early 20s to the over 60s came along. If you missed this event, there is another in the new year at Chelsea Library which will take place in March 2014. For more information please visit The Open University’s website. To see what other events we have check out our What’s On page on our website. It’s been a long time coming but we finally have some new signage in the adult lending and children’s libraries. I really enjoyed working with the borough’s designer and the graphics company to ensure we got the signage we needed. It was fascinating learning about fonts, types of signs and even staying late to supervise the installation. We really hope our customers find the library easier to use. The staff have done an excellent job at decorating the library for this special time – hope you like our decorations! We also had a very special visitor on Friday 20 December – Father Christmas made time in his busy schedule to attend our baby rhyme time. Kids and adults alike very pleased to see him and he felt like a celebrity with all the photos that were taken! Father Christmas at Kensington Central Library! At our last story and craft session on Saturday 21 December – the children had great fun making Christmas wreaths using paper plates, green paper and red glitter. So Happy Christmas from us all! On Monday 9 December, from 11am to 6.30pm, The Open University will be at Kensington Central Reference Library. If you haven’t studied with The Open University before, or you have had a few years away from study, then this event is for you! Come along to get answers to your questions about qualifications and modules, study methods and other aspects of learning with The Open University. Just drop in on the day– no appointment necessary. For more information about what they have to offer check out The Open University’s website. Did you know that we hold Career Advice sessions on a 1:1 basis every Monday at Kensington Central Library? If you are aged 19+ you can book a session with a National Careers Service adviser. To book an appointment please ask library staff or call 020 7361 3010. There’s more information about how the advisers can help you on the Career Advice page on our website. Sandeep Dhaliwal, one of our Tri-Borough Reference Librarians blogged recently about The Open University coming to Kensington Central Library last month to deliver one of their Information Events. Just drop in – no appointment necessary and for more information please visit The Open University’s website. 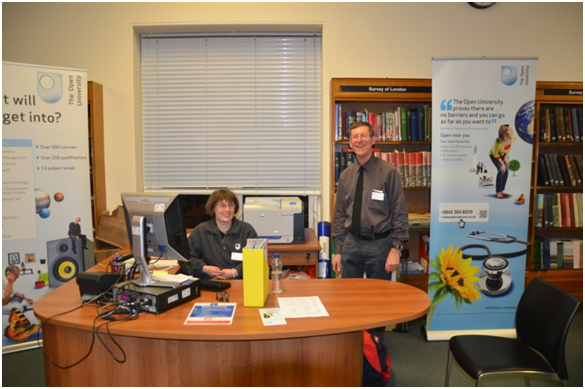 Welcome to our first blog post of 2013 and let me wish Happy New Year to you from all the staff at Kensington Central Library. I’m aware that our last post didn’t contain anything from our reference library so this month we have two members of the reference team introducing themselves and telling us a little more about what they do. First up is Colin Clare who tells us about the borough’s A to Z Director, followed by Nina Risoli who tells us about her job as a reference librarian. I work in our reference libraries at Kensington Central and Chelsea libraries. I am part of a small team that maintains and update all the entries in the borough’s A to Z directory. Need to find a local doctor or dentist or perhaps find out about your local leisure centre, Councillor or school? Well you can, by logging onto the local information database for the Royal Borough of Kensington & Chelsea, www.rbkc.gov.uk and look for the A to Z Directory. This is a valuable source of information containing details about clubs, organisations and Council services as well as charities, youth organisations, voluntary organisations, sports clubs and much more. It is the definitive source that will enable you to get the most out of living in the Kensington & Chelsea area and to find instant details about your community. The database receives over 65,000 visits each month making it one of the most popular sections of the website. What does a reference librarian do? When they hear I work as a librarian people often say to me: “How lovely, you must read a lot at work!”, and I try to explain that reading is not really a major part of my working day. I am a reference librarian in Kensington Central Reference library and my main duties include answering enquiries from visitors to the library and those that arrive via post, email or telephone. This is the interesting part of my job as people come with a huge variety of questions and requests. I am also responsible for managing stock, making sure we have the right books on the shelves, that they are in good condition, in date and relevant to our users. I also spend a lot of time promoting library services and our online resources, as well as training staff and public to use these resources – I’ve recently written for the blog about some of our online resources. I also organise tours of the library and events to promote special collections such as Chelsea’s fashion and costume collection for library staff, students and visitors. Although in truth there is rarely time to do any reading at work, I do love my job for the variety it offers and the opportunity to learn something new each day. This month the books we have on display from our biography collection are stars from Hollywood. To book a place please call 020 7361 3010. More information about these tours and our other upcoming events can be found on our website. We were very lucky to have a local story teller, Laura Collins come to the children’s library on 2 January. She told a group of children the story how the robin got his red breast – the children really enjoyed this tale. They enjoyed too making their very own robins out of two paper plates with a red breast out of tissue paper! Me and my colleague, Gemma Baker made a robin each to show the children what to do. The ones the children made were much better! We have story and craft sessions during every school holiday – look out for posters in the children’s library for the next session and on our website.